The Grey Langur is a group of Old World Monkeys. These langurs are found basically in South Asia and these langurs belong to the genus of Semnopithecus When only one species of these langurs was recognized, it was also called the Hanuman Langur which is named after the Hindu vanara divinity Hanuman, the Common Langur and the Entellus Langur. In Sri Lanka, it is natively known as the Wanderoo .They are also known as Hanuman Langurs. Grey Langurs are large, inhabiting animal and mainly found in the areas which are located in the Indian Subcontinent. These langurs are generally of grey color, with a black face. Male grey langurs are up to 75 cm long and female langurs are 65 cm long. Langurs that are living in Southern part of this hill are generally smaller in size as compared to langurs that are living in the Northern side. These langurs mostly feed on buds, leaves, fruits and flowers. 90% of their time is spent on the ground. They can walk continuously for hours. Basically they move in large or medium groups, one cannot see these langurs walking alone. When these langurs are moving in groups they usually have one male member in the group. Grey langurs are fairly terrestrial and are inhabitants of the Indian subcontinent and also found in lightly opened wooden habitats. 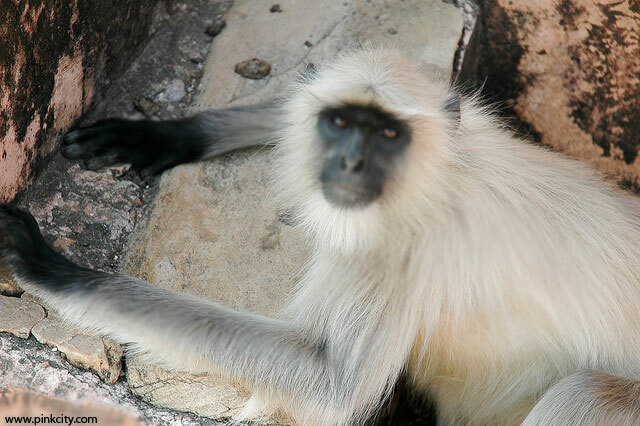 The grey langurs are found in Jaigarh Fort also. Jaigarh fort is one of the famous monuments which was built in the 18th century. This fort is located in the Amer City which was ruled by the Kachawahas from the early 10th century. Jaigarh fort is also known as “The Fort of the Victory” which was constructed by Sawai Jai Singh II and Mirza Raja Jai Singh in 1726. This fort is located at an approximate height of 500 feet on the top of the hill named as ‘Cheel Ka Teela’ or Hill of Eagles. The fort can also be reached on foot. The fort was built to safeguard Amber palace and a three kilometer fortification wall surrounds the Jai Garh Fort. Jaigarh Fort kept the treasures of the royal family of the Maharaja of Jaipur, in the form of massive gold bullions. The langurs fight for a better place to get snacks from the visitors at Jaigarh Fort. There are all sorts of monkeys in the Jaigarh Fort such as- big, fat, baby and of all kinds. These monkeys have not harmed anyone till date. But their movements, jumping almost terrify every visitor. The monkey temple at the fort seems amazing. There are three pools of water where villagers take bath and the womenfolk also take bath in those pools along with the men folk. Most of the people covered the distance to this pilgrimage on foot from their villages. These people look so innocent, simple and loving. The water falls from the top of the place. In earlier times, this temple is known to be the ashram of Galav rishi. Galta ji temple is also known as Monkey temple which is situated in the Aravalli mountain ranges in the eastern part of the Jaipur City. One important fact which is linked with this temple is that some part of Ram Charit Manas i.e. Ramayana is written in this temple by Goswami Tulsidas. Galta Ji located 20 kms away from Jaipur. It is said that the Galta kund has curative powers and because of it this is known as pilgrim centre. There is a small temple of Sun god which is built by Diwan Kriparam and is located on the top of the highest peak. In ancient times as well, at the time of Ramayana, the monkey God or Hanuman Ji was true friend of Shri Ram. The entire area is so beautiful that you can’t miss out even a single place in it. Some of the monkeys are even featured in the ward winning series of Nat Geo which was named as Monkey thieves or as the Galta Gang.